Okay, that title really does seem to sum up my month. Not just referring to the zentangles I’ve done this month, but to the state of my brain and my life in general. Here it is a week from the March start date for DH and we are still in limbo as to whether he is starting next Monday or not. There was a small step forward last week. I’m just so confused about this long delay. It seems his personnel manager isn’t being kept in the loop either as each month there is communication asking why he isn’t starting yet. But, we can’t get housing because we can’t prove income yet. Gah! I’m not certain I really see much of a progression this time around. Though that probably has to do with my general stress level and the fact that as the month progressed I did more of my tangling in my lap rather than at a table. What Life Lessons Am I Learning From Zentangle? Zentangle 2015-047, Day 22 of One Zentangle A Day featuring Tagh and Tat with Squid, Sampson, Festune, Ynix and Fracus (variant). I began working my way through One Zentangle a Day by Beckah Krahula about mid-January. After three weeks I was struggling with only having enough time in a day to do the exercises and not having time for personal exploration. So I took roughly a week off and am back at it as of yesterday. I will admit it. I groaned when I saw the patterns for my first day back – organic shaped and one of them is a complex, one stroke pattern (Tat). I love the organic feeling zentangles I see on Pintrest or in blogland. I hate the organic zentangles I’ve produced. Why is that? Also, I seem to be a short stroke pattern person. I tend to make my patterns pretty small (somewhat of a control/perfectionist issue I’m sure) and have not been a fan of the single stroke patterns I’ve attempted thus far. I’m guessing there are some really profound things these aversions have to say about me. Care to help me decipher them? 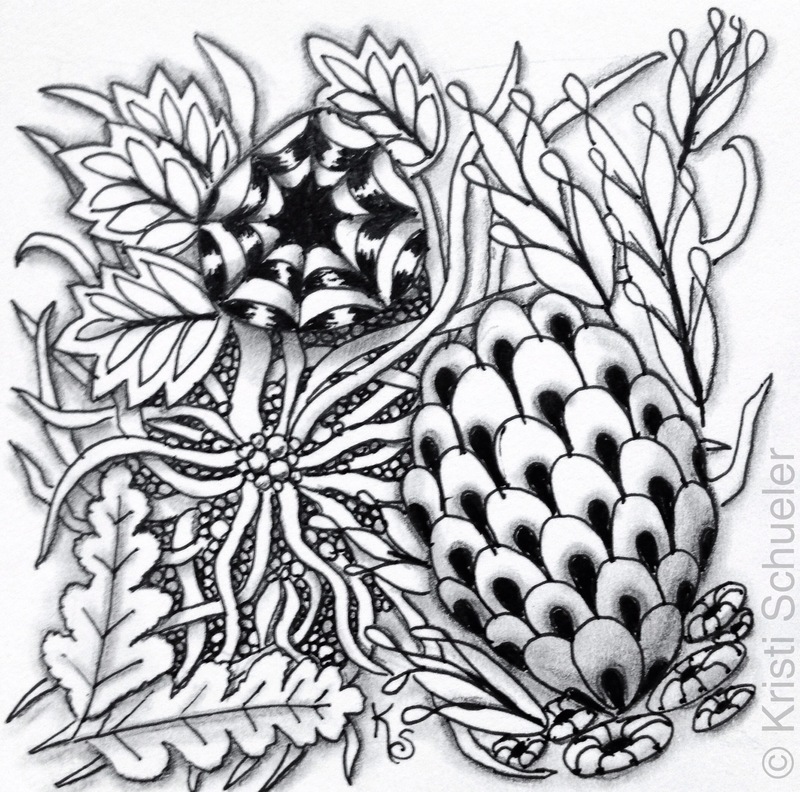 Format GalleryPosted on February 17, 2015 February 17, 2015 Author Kristi SanseraserCategories One Zentangle A Day BookTags 365 zentangles, festune, fracus, one zentangle a day, organic tangles, sampson, squid, tagh, tat, ynixLeave a comment on What Life Lessons Am I Learning From Zentangle?